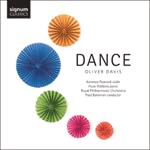 With this album I was keen to explore the various traditional forms of dance, including its role in folk music. In the opening movement of Dancing Folk I used the Bavarian dance form Zwiefacher, the rhythmic complexity of which appealed to me. I then searched for other contrasting dance styles, which resulted in the hoe-down style of the middle movement and a calypso feel to the last.